Dwarf lionfish (or is it lion fishes?) are popular and intriguing tank fish because of their remarkable coloration and shape, but also because of the graceful yet venomous danger held in their iconic, flowing fins. is a scorpionfish belonging to the genus Dendrochirus. The most popular species in this genus are D. biocellatus (Fu Manchu or Two spot), D. brachyptherus (Dwarf Fuzzy Lionfish) and D. zebra (Dwarf zebra lionfish). Dwarf lion fish inhabit shallow coastal waters and have an affinity for caves and rocky outcrops there they can ambush their prey, mainly consisting of small crustaceans. They don’t require much room to swim and don’t grow very large, so they can probably be kept in a 55 gallon tank, or larger. As is the case for most fishes, adding some rock work will create structures for hiding in and will likely help the fish swim about with less fear. While this lionfish may start out small–it is not a dwarf species and will grow to be more than a foot long! Lion fish that are in the genus Pterois are full-sized lionfish, not dwarves and need a much larger tank to be happy. 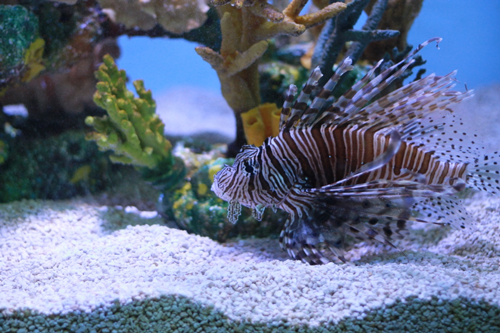 Lionfish may be shy when first introduced into the aquarium. I don’t have any specific unique advice to help coax out a shy lionfish, but the tried and true advice should help. Do your best to minimize vibrations and fast movement. Create areas of open and structure and introduce other suitable fish (that the lion won’t eat) to encourage swimming. Lionfish are greedy eaters that prefer to hunt and eat live foods. When feeding, the lionfish will spread its pectoral fins out wide and methodically push the prey back, trapping it until it can be swallowed whole. A lionfish can open its mouth surprisingly wide. It is possible to get them to eat frozen and/or prepared foods by training them to accept these non-living foods instead. Training a dwarf lionfish to eat frozen foods is a lot like fishing—so if you enjoy both hobbies (like I do), that might be the best of both worlds! The trick is to trigger the dwarf lionfish’s predatory instincts by moving the food around, mimicking the movement of a prey organism. Patience is important, as is trying to minimize unnatural movements to make the food appear more appetizing to these masterful predators. The Dwarf Lionfish is a greedy eater that won’t show moderation on its own. In the wild, it is not likely that they would catch meals each and every day, so to maintain portion control and not over-feed your lions, try to feed small-to-moderate amounts every other day or so. You may want to mix it up a bit and not make it exactly regular—but the point is that you want a full, happy, but not obese lionfish. The Dwarf Lionfish, technically speaking, is reef safe but not invertebrate safe—meaning, they won’t hurt sessile inverts like your SPS corals, LPS corals, Zoanthids or soft corals (unless they cause accidental damage while hunting for dinner), but they will hunt down and eat any fishes, shrimps, or crabs small enough to fit in their mouths (and you’d be surprised how big their mouths really are). 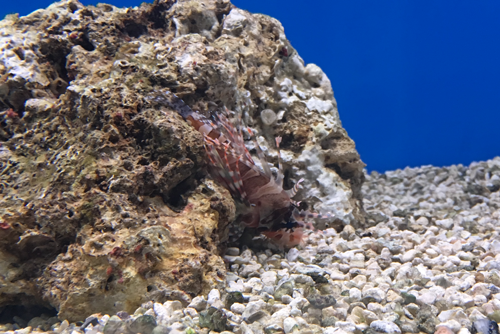 While they would not directly nip at coral polyps and harm the corals that way, Dwarf Lionfish are ‘sloppy eaters’ and would require some pretty significant maintenance to keep water parameters in line for a traditional reef tank. For that reason, most hobbyists keep dwarf lion fish with other predators (large enough not to get swallowed) or poisonous fish species that wouldn’t be harmed by the lionfish in a fish only aquarium. Triggerfish, large rabbitfish and puffers are common dwarf lion fish companions although even these fish are not guaranteed to be able to outmaneuver hungry lions forever. Lionfish have venomous spines. If you get stung, it is typically recommended that you get medical attention. Some have advised that you can neutralize some of the damage the venom causes by submerging the area stun in a hot water bath. The proteins in the venom that cause the damage in your body can theoretically be damaged themselves with the high heat. The challenge is finding a temperature that destroys the venom, without hurting you in the process. Yikes. 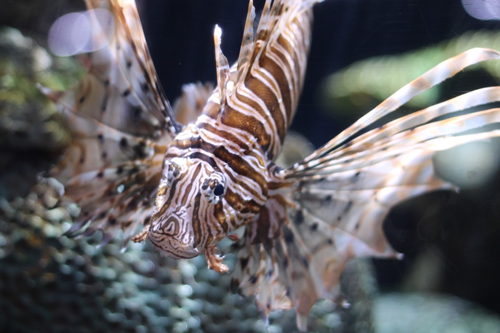 Dwarf lionfish owners report that their fish recognize and greet them, when they enter the room, seeming to beg for food much like a dog would. The Dwarf Zebra Lionfish is one of the most popular species and gets its name because of the red white and black vertical stripes along its body and fins. This lionfish’s diet in the wild is primarily shrimp. It can grow to about 7 inches. The Fu Man Chu Dwarf Lionfish has distinctive fins around the face which give it the Fu Man Chu look (and name). They grow to be 5 – 6 inches long and are relatively shy, slow-moving fish that might not thrive with the most boisterous companions. These fish get their name from the fuzzy texture of their scales and the unique stripes and patterns on their pectoral fins. They come in three main colors: plain brown, striking red and a rare yellowish hue. Adult males have 6 – 10 black stripes, while females only have 4 – 6 stripes. Fuzzy lions are some of the most easily kept in a tank for two main reasons: they are hardy and easy to wean onto frozen and prepared foods, and they are somewhat peaceful and won’t bother other similar-sized fish in the tank. 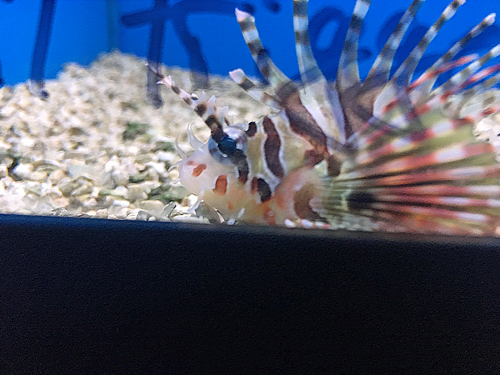 If you are looking to buy a dwarf lionfish and you don’t have a trusted local fish store nearby, you might want to check out the availability on Liveaquaria and That Fish Place. That Fish Place is a relatively local shop for me (in Pennsylvania) and they sell a lot of livestock online–and of course–Liveaquaria is one of the top online stores in the country. I don’t have any affiliation with either of these stores, I just know they have great reputations. Do you have a dwarf lionfish? Tell us about yours. Yikes, considering the fact that my hand is in the water when I scrape the sides of the tank, I’ll pass on this one. But I have gained insight and appreciation for this fish; and when I see a tank with one in it, I’ll be impressed even more. Thanks for this very interesting blog. Beth, thanks for the nice note. Nothing like a shot of venom in your arm to shake away a case of the Mondays. I have found over the years. Lionfish and puffers not good. With the puffer getting the short end of the stick. Steve, thanks for feedback. No puffers then either.